Although the painters of these schools are classed as followers of Raphael, they show distinctive characteristics of their own, especially in color, which, however, shows some Venetian influence. Dosso Dossi (1479-1542) of Ferrara was the strongest painter of these schools, a man of much fancy and of a strikingly original treatment of landscape. In his color he was strongly influenced by the Venetians, and his portraits are said to have been worthy rivals of Titian’s. Benvenuto Qarofolo (1481-1559) was called by the Ferrarese the Ferrarese Raphael. Wornum calls him “a Raphael in little.” He followed the Ferrarese painters first, but later he came under Raphael’s influence at Rome, and after that his work shows the type of face and sweep of line distinctive of Raphael’s style. His earlier pictures are the best, however, for his work in thé Roman style was very mannered. His best work is perhaps the Adoration of the Magi, in Ferrara, where he is more natural, although the style is more like that of the period preceding Leonardo da Vinci than of that after him. His drawing shows many weaknesses and false proportions in some pictures. Bagnacavallo (1484-1542) was first a pupil of Francia at Bologna, but afterwards he became one of the most ardent of Raphael’s followers. So much was this so that he claimed that there was more to be learned from Raphael than from nature herself, “inasmuch as men of ordinary ability must be content of necessity to learn mediately through higher geniuses.” His masterpiece, Madonna and Child in Glory, in the Dresden Gallery, is charming, and an instance of his close following of Raphael, although he does not succeed in giving the inner spirit through the outward form as did Raphael. Correggio (1494?-1534) bas been variously classed with the Ferrara, Bologna and Lombard schools. The latter is a vague term. Moreover. Correggio can hardly be classed in any school or as the follower of any master, for he is absolutely himself and struck an original note in art. The greater part of his work was done at Parma, and his influence there was felt by painters who founded the so-called school of Parma. The might of Michelangelo, the serene grandeur of Raphael, the religious feeling of Fra Bartolommeo are not to be seen in Correggio. He comes nearer Leonardo da Vinci than any, but only in the external matter of light and shade, the poetry of which comes out to the fullest extent in Correggio. He has none of the depth of soul of Leonardo, none of the sublimely grand, sensuous quality of the Venetians; but through his work runs an indescribable grace, a joyousness and fullness of life, a lively rhythm of motion, and a passionate worship of nature, that have rightly earned him the title of the ‘‘Faun’’ of the Renaissance. It is in him that the worship of nature pure and simple reaches its height, and it is in this love of nature,, of its joyous moods and vivacity of life, that he is the Faun. There is never a sad note struck in Correggio’s work; all is like an early summer day. He cared not to tell a story or to pcint a moral. All was done for the love of nature’s beauties, its mystery of light and shade and envelope, the beanty of a rounded arm, the soft bloom on a cheek, the depth and glow and sparkle of color. His many pictures are mostly religious in subject, but he treated them not for the religious purpose. Even here there is the same joyousness, the same earthly beauty and life and vivacity. In composi- tion Correggio cared less for line than for placing a beautiful scheme and arrangement of light and dark on the canvas. His draw- ing was not always of the surest, but his rendering of values was superb, and his soft, all-surrounding atmosphere was beau- tiful beyond description. In color, he stood beside the great Venetians, and his brush- work is full of life and verve. About Correggio’s life very little is defi- nitely known, although much has been written and conjectured. He seems to have led an uneventful life and to have traveled little. He is supposed to have learned from Lorenzo Costa and Mantegna, but if he was ever under the influence of the latter, his mature work does not show it. The only thing about his work that suggests Mantegna’s influence is his fondness for foreshortening, which he sometimes carried to excess. For instance, in his Assumption of the Virgin in the Cathedral at Parma, he foreshortened the figures so violently that almost nothing but legs are seen; and it was said jestingly that he had painted “a hash of frogs.” Correggio’s principal works are at Parma. In the same cathedral with the Assumption of the Virgin he painted Christ in Glory Surrounded by Apostles, and a Coronation of the Virgin. In the convent of S. Paolo he painted in a saloon for the abbess subjects from ancient mythology. These are among his most beautiful works Kugler says about these: “On the principal wall is Diana returning from the chase, in a car drawn by white stags; the light drapery of the goddess conceals but little of her per fect and youthful form.. On the ceiling is painted a vine-arbor, with sixteen oval openings, in which are charming groups of genii, some with attrib utes of the chase, ? hounds, hounds, the head of a stag, etc. ; some caress each other, some pluck fruits from the borders of the arbor. It is im possible to conceive more graceful, at tractive gaiety than in the figures of these genii. Underneath are sixteen lunettes in chiaroscuro, filled also with mythical subjects? the Graces, Fortune, the Fates, Satyrs, etc. The choice of these sub jects for a convent appears strange; but in the sixteenth cen tury the nuns of Italy enjoyed the greatest freedom, without being shut up, while the abbess lived in princely splendor and luxury. Correggio’s easel pictures are spread all over the world in various galleries. The Marriage of St. Catherine, in the Louvre, is a beautiful example of his composition by lights and darks rather than by line. What a masterful arrangement of spots, what a beautiful glimmer and caress of lights, what an exquisite transparency of shadows and roundness of form! There is over it all a feeling like a song of spring, joyous, but gentle, graceful, tender and sweet. It is one of the sweetest lyrics of the world. The La Notte, in the Dresden Gallery, is perhaps better known than any other of his pictures, and has been classed with the so-called twelve pictures of the world. There is a most astounding mastery of the effect of light in this picture, a light unearthly in its sweetness and brightness as it emanates from the figure of the Christ child. Correg gio’s joyousness of spirit comes out to the full here in the radiant joy and love of the mother, in the eager, gladsome shepherds, and in the face of the young girl who shields her eyes from the dazzling glory shining from the figure of the child. There is the most wonderful management of values in this picture; how deep the gloom in the shadows and still how transparent; how allenveloping the atmosphere, and how soft the light of the new-born day just faintly lighting up the horizon! There is the most wonderful contrast of brilliancy and depth here, of soft tenderness of half-tones and tremulous light, with the effulgence which centers around the mother and child. The whole is a beautiful song of gladness over the promised child. 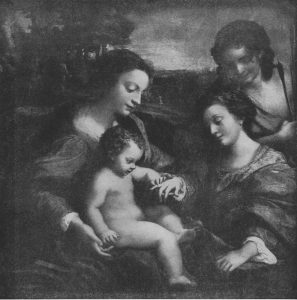 It was a popular tradition that Correggio lived and died poor and unappreciated; but later investigations have disproved this, and the poetic tale of his death is no longer credited;- V , Correggio had a number of followers, but what had proved the rule with Michelangelo’s and Raphael’s followers did not fail here. The method and the externals were seized upon, whereas the spirit was entirely passed by. Correggio’s son, Pomponio Allegri was a painter of some merit, but he fell entirely below his father’s level. Parmigianino (1504-1540), whose real name was Francesco Mazzola, or Mazzuoli, was Correggio’s best follower. He tried to combine the grace and soft charm of Corregio with the grandeur of Florentine line and the attempt,as might be expected, proved a failure. Imitation brings mannerisms and Parmigianino was unpleasantly mannered. The Madonna of the Long Neck, in the Pitti Gallery, is a good example of his mannered style. All members of the body have been so elongated to obtain grace that the figure appears pulled out of shape, and there is an attempt at the grand which ends in feeble- ness. There are still touches of real charm in Parmigianino’s work, as in the Cupid Framing His Bow, in the Gallery at Vienna; and in his Moses Breaking the Tables of the Law, in the Santa Maria della Steccata, he strikes a note of real grandeur.